We are so deeply sorry to report the passing of one of our department’s bright stars, Angeline Olliff. Angeline joined us in Spring 2008 as a junior transfer student from Pierce College. She entered the Honors option in Fall 2008 and graduated in Fall 2009. Her honors thesis grew out of a paper she wrote in an earlier course in which she (rather surprisingly, but brilliantly) compared texts by Margaret Fuller, Fanny Fern, and Ernest Hemingway, examining how each writer dealt with womanhood and marriage. Her Honors thesis, “The Pragmatic Feminine in Faulkner and Hemingway,” shifted focus to the twentieth century, utilizing pragmatist criticism to offer lively, engaging and smart interpretations of Dewey Dell and Margot Macomber. She won the Robert apRoberts English Honors Essay Prize in Spring 2010 for this thesis. She did all of this while maintaining a near perfect GPA and achieving a GRE verbal score that ranked her in the top two percent of the nation. 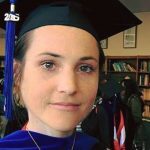 When she joined our MA program in Fall 2010, she shifted focus to Rhetoric and Composition and threw herself with customary enthusiasm into her work as a TA. She became a devotee of whole class workshops for her writing students, researching intensively their efficacy and best practices and regaling her fellow English 698D students with stories of both disaster and success in the classroom. In 2015, she won first place at the annual CSUN Symposium for her presentation “Encouraging the ‘Risks of Caring’: A Cognitive Development Approach to Collaborative Learning in the FYC Classroom.” She graduated with her MA in spring of that year. In addition to her myriad academic skills, Angeline brought to the table a sense of zest and determination rooted in her turbulent adolescence. Her struggles with body image issues made her sensitive to the ways in which our identities are culturally shaped, often in traumatic and problematic ways. She was committed to making use of her experiences to find ways to transform the lives of others; even as an undergraduate she dedicated time to work with troubled high school students and others who were struggling. In her academic work, she never pressed these ideas narrowly or exclusively. But it is clear from the topics she chose to write about that her experiences gave her a deeply personal investment in her scholarship and allowed her to understand and connect with her own students as they struggled to form and maintain their own identities. Whatever Angeline did, she did with intensity, purpose, and dry but loving humor. She passed away on January 25, 2018. She will be very much missed. This Friday (tomorrow), February 9th, at 7:00 p.m. in Jerome Richfield Hall, Room 319, the Reimagining Narrative Film Series returns with a special screening of David Lynch & Mark Frost’s “Twin Peaks: The Return, Part 8.” As Noel Murray puts it in his New York Times review, “There’s nothing to point to in the history of television that helps describe exactly what this episode attempts.” Please note: this film can be viewed as a standalone, so no prior knowledge of the show is necessary. Free and open to the public, the 2017-2018 series is dedicated to the study and discussion of dream narrative. Curated collaboratively by Dr. Christopher Higgs & Katharine Mason, M.A., each film in the series will be introduced and contextualized prior to screening, with an open discussion to follow. In general, the series seeks to provide an opportunity for shared critical and creative thought and discussion by bringing together an interdisciplinary audience of students, faculty, and members of the community interested in narrative construction. Refreshments provided. For more information, contact Professor Higgs, christopher.higgs@csun.edu, or Ms. Mason, masonklc@gmail.com. Sigma Tau Delta is proud to announce a special guest lecture by Mark Marino, Associate Professor and Director of Humanities and Critical Code Studies Lab at USC. Sponsored in part by the College of Humanities, Marino’s talk is titled, “Reading and Writing in the Digital Age: Electronic Literature from Interactive Stories to Twitter Fiction,” and will take place on February 20, from 4:00 p.m. to 6:45 p.m., in JR 319. For more information, visit www.csun.edu/english/pop-culture. Becoming Nicole: The Transformation of an American Family, by Amy Ellis Nutt, a book that tells the true story of a transgender girl and her family’s journey towards acceptance and ultimate celebration of her identity. At times a deeply personal story, the book also chronicles the family’s long legal struggle in support of their daughter. For more information and ways to get involved and help support the Freshman Common Reading project, please see https://www.csun.edu/undergraduate-studies/academic-first-year-experiences/news/2018-2019-freshman-common-read-announced. Mark your calendars now for the first ever annual Humanities Advocacy Day, taking place on Tuesday, March 13, in the Ferman Presentation Room of Oviatt Library. Keynote speaker, CSUN alumnus Mark Lopez, M.A. Chicano Studies and Recipient of the 2017 Goldman Environmental Prize, North America, will speak at 11:00 a.m., and a reception will follow at 12:15 p.m.
Spring elections for faculty governance positions will be held in March. Nominations for faculty officers, senators-at-large, and one representative to the Academic Senate CSU will be taken at the next Faculty Senate meeting on February 15. Senators may also make recommendations for Standing Committee representatives. If you would like to be nominated for any of these positions, please contact Faculty President Adam Swenson or any member of the Faculty Senate prior to the meeting. The current roster may be found on the Faculty Senate website http://www.csun.edu/faculty-senate. The English Grammar Lab, now at the Learning Resource Center, is offering walk-in appointments, Monday through Thursday, from 9:30 a.m. to 4:30 p.m. This one is for undergraduate students who have completed less than 120 units and who are interested in government and/or politics. The 2018 Panetta Congressional Internship is now accepting applications for the Fall intern program which will send one CSUN student to Washington to work for a member of the California Congressional delegation. A scholarship covers all expenses. Please let interested students know about this exciting opportunity. The application deadline is Friday, February 23, 2018, by 4:00 p.m. to the Undergraduate Studies office (UN 215, MD 8203). For additional information, please see www.panettainstitute.org/programs/study-with-us/congressional-intern-training. Another opportunity of interest for undergraduates is a call for submissions from the Comparative Literature Undergraduate Journal (CLUJ) at the University of California, Berkeley. For over seven years this journal has been showcasing the best undergraduate research in comparative literature and media from universities all over the world. The journal is currently inviting submissions, in any language, from undergraduate students working in, around, or critically engaging with literary topics in a comparative nature. Possible topics include but are not limited to papers comparing at least two authors or texts, interdisciplinary research engaging multiple disciplines within the humanities, and research engaging with literary theory and schools of criticism. For more information and full submission guidelines, please visit their submissions page. Authors whose papers are selected for publication will receive free copies of the issue in which they are published. The deadline for this the Spring 2018 issue is February 15, at midnight, Pacific Time. Closer to home, CSUN’s CAPTURED Student Multi-Media Journal Team is looking for a LEAD Student Editor. This is a paid position, with salary commensurate with experience, and will begin as soon as possible. Applicants must be an upper division or graduate student, with excellent writing and grammatical skills, and editorial experience. Responsibilities include assisting with developing strategies for soliciting and reviewing submissions electronically, assisting in working with graphic and website design, and assisting with managing the production process of the journal. Interested students should send a resume, cover letter, and writing sample to: Dr. Theresa White at theresa.white@csun.edu. CSUN alumni, Juan “Moncho” Alvarado, who won the Academy of American Poets Award when he was at CSUN, has done it again, winning his second such award during his final semester at Sarah Lawrence, where he completed his MFA last year. The poem, which received the 2017 John B Santoianni Award for Excellence in Poetry can be read here: https://www.poets.org/academy-american-poets/john-b-santoianni-award-excellence-poetry-2017. In addition, Juan has been awarded Poets House Emerging Writers fellowship this year. Fellows receive $5,000 each, membership to the Center for Fiction in New York City, and access to writing space at the center. Winners also have the opportunity to meet with editors and agents who represent new writers. Jeff Baker’s article, “Style in Gravity’s Rainbow: Deweyan Art as Democratic Experience,” is forthcoming in On Style: Transdisciplinary Articulations, Bern: Peter Lang, 2018. Even better, Jeff also received a Fulbright Specialist Award for Fall, 2018, and will be a visiting Fulbright Professor at the University of Antwerp. Irene Clark and Bettina Huber‘s chapter titled “Gains in Written Communication between the Freshman and Junior Years” has been published in _Learning From the Learners: Successful College Students Share their Effective Learning Habits_, edited by Elizabeth Berry, Bettina J. Huber, and Cynthia Z. Rawitch (Rowan and LIttlefield 2018). Sharon Klein also has a chapter, “Sliding Into Learning: The Power of Webnotes,” co-written with Carrie Rothstein-Fisch, in this same book. JYI student Lesly Fernandez has won one of three $7,500 Wells Fargo Teaching Scholarships for a CSUN senior with a minimum GPA of 3.5 who wishes to pursue an English, Math, or Special Education credential through a post-baccalaureate Michael D. Eisner College of Education teacher credentialing program. Award applicants are required to write a double-spaced essay (approximately 250 words) in which they describe a challenge, triumph, personal relationship or other life experience that has impacted their decision to become a professional educator. Preference is given to candidates who showcase community involvement or have contributed to the field of education in the past. Kate Haake had an essay, “Breathing Through Skin: Notable Birds and Amphibians of My Life,” published in the 2018 Winter issue of Catamaran.